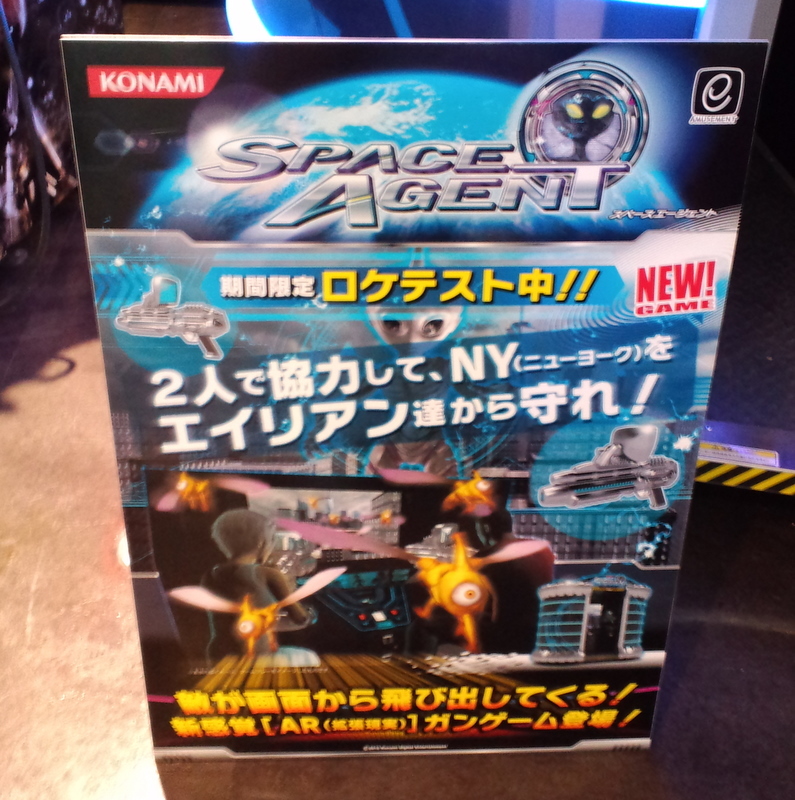 The Am-Net Blog has pictures of the marketing materials for a new Konami light-gun game testing in Japan called Space Agent. Not much is known about the new game at this point but what is clear is that it uses a mostly enclosed cabinet, it has e-Amusement features and mounted guns which add an element of “Augmented Reality” to the game. On top of the guns is a screen that has something to do with that AR feature, most likely in finding enemies. In that way it’s actually like Silent Scope but we’ll have to wait and see how similar it might be to SS. The cabinet does look cool as do the guns but they could always tweak the design before the final release. Space Agent is currently testing at the ROUND Store in Yokohama Nishiguchi, right next to the Terminator Salvation game there judging by the picture to the right here. It’s too bad AM-Net can’t take any pictures or video of the cabinet directly (Konami is usually pretty harsh on photos at loctests, although occasionally they let up on it or people manage to sneak it) but if we’re lucky someone will post some of that soon. UPDATED: Japanese site Small Room Aries has posted details about the game from the location test. The level provided has you defending New York City from alien attack and it appears that there is a special mode for the cameras mounted on the guns. They mention that the game will often switch into this mode, probably as the aliens are hiding and you have to uncover them. The guns have two firing features, a regular shot and a pump shot, and instead of reloading you have to watch an overheat meter. Even though it’s fairly large, I like the cabinet design. While it’s one of those that could become an infamous “den of iniquity” cabinet due to the enclosure, it’s very eye-catching.